Tuscaloosa. — Artist Wendy White will give a public lecture on Tuesday, February 27, 2018, at 6:30 p.m. in Gallalee Hall Room 227, on UA campus. Wendy White’s work has been described as “most preoccupied with the lifespan of seemingly dissonant places, people, and things, all of which are bound by the same sense of impermanence and eventual decay.” The themes of White’s work include athletes and athletics, machismo culture, domesticity, branding and pop culture, which she expresses with photographic images, layered fields of paint, cutout shapes, letters, text and spray-painted graffiti. Wendy White lives and works in New York City. She holds a BFA from the Savannah College of Art and Design and an MFA from Mason Gross School of the Arts at Rutgers University. Her exhibitions include The Art Show: Art of the New Millenium in Taguchi Art Collection, Museum of Modern Art, Gunma, Japan; Futbol: The Beautiful Game, Los Angeles County Museum of Art (2014); Taguchi Hiroshi Art Collection: A Walk around the Contemporary Art World after Paradigm Shift, Museum of Fine Arts, Gifu, Japan (2015); So Athletic, Kunstverein Rosa-Luxemburg-Platz, Berlin (2012); Informal Relations, Indianapolis Museum of Contemporary Art (2011); Hue & Cry, Sotheby’s S|2, New York, N.Y. (2012); Idealizing the Imaginary: Invention and Illusion in Contemporary Painting, Oakland University, Mich. (2012); Third Thoughts, CCA Andratx, Mallorca, Spain (2010); and Borderland Abstraction, Bemis Center for Contemporary Arts, Omaha, Neb. (2010). She has had solo exhibitions at Leo Koenig Inc., New York, N.Y.; Jablonka Maruani Mercier, Brussels, Belgium; Van Horn, Düsseldorf, Germany, Andrew Rafacz Gallery, Chicago; Cabinet, Milan; Galerie Jérôme Pauchant, Paris; and Galeria Moriarty, Madrid. White is the recipient of a New York Foundation for the Arts painting fellowship in 2012 and a George Segal painting grant in 2008. Her work was featured in Phaidon’s anthology Vitamin P2: New Perspectives in Painting and will be included in the forthcoming group show entitled The World’s Game: Fútbol and Contemporary Art, curated by Franklin Sirmans, at Perez Art Museum, Miami. Her website is here: http://www.wendywhite.net/. 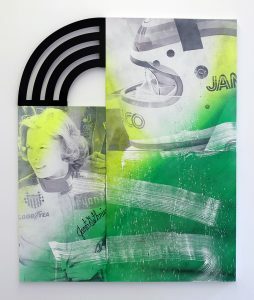 Image Credit: Wendy White, Janet Guthrie, 2017, acrylic and inkjet on three canvases, Dibond, 72 1/4 x 60 1/4 inches. Image courtesy of the artist. Wendy White’s lecture is part of the Visiting Artist and Scholar Lecture Series, sponsored by the Department of Art and Art History, the Visiting Artist and Scholar Committee, the College of Arts and Sciences and the College of Continuing Studies at The University of Alabama. To see our past and future visiting artists and scholars, click here. Gallalee Hall, 174 6th Ave., Tuscaloosa, is a little over five-minute walk from the Campus Drive Parking Deck and Bus Hub on Hackberry Lane. Information about visitor parking is available here: http://bamaparking.ua.edu/visitor-information/. Parking is free on campus in a legal space after business hours.